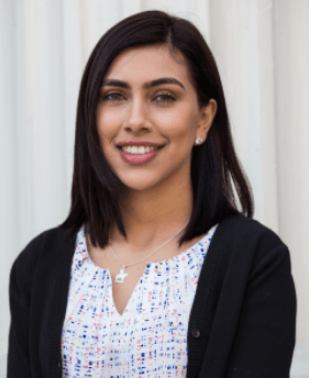 Jacqueline Garcia, Politics ’19, is a Newmark scholar as well as a recipient of the Betty L. Blakley scholarship. USF in D.C.—what an experience! On many levels and in ways I didn’t expect, the semester I spent in Washington D.C. changed me. I’ve always had an interest in public service and the common good; one of that typical twenty-something-year-old, “change the world” mentalities. The McCarthy center gave me the opportunity to put my class teachings and my personal aspirations into practice. Experience is truly the best teacher. During my USF in DC experience, I interned at the National Immigration Forum (NIF), a non-profit advocacy group pushing for fair immigration reform. I was the Field and Advocacy intern for the organization’s Bible, Badges, and Business (BBB) program. This experience was extremely valuable. First, it gave me insight in regards to what an advocacy group looks like from the inside. I learned the tactics and strategies used to keep members informed and also how to include members in the process of action planning. Second, I acquired new skills while working at the NIF. In particular, I learned to use different software systems like Salesforce and Cision. Lastly, the BBB program is targeted at moderate to conservative-leaning groups. As a native Californian, some of the views these groups hold were foreign to me. At the NIF, I was provided the opportunity to get out of my liberal bubble and worked with people who had opposing views to my own. What I learned about myself was that I am more tolerant than I thought and that my own views are subject to change. This experience gave me a new perspective of the world I live in and my place in it. While in D.C. I tried to get out into the city as much as I could. It’s a dynamic place with a lot to see and even more to learn. Nearly 50% of the population in D.C. is African-American. Almost every Lyft or Uber driver I had was an immigrant from either Africa or Latin America. This city runs on the labor of these minority groups yet the administration right down the street ignores their needs. So, going to D.C. was a great learning experience and also a form of validation for myself. As young people, we have ideas of who we want to be, but there are inevitably moments of doubt that we can actually accomplish those aspirations. D.C. allowed me to expel that doubt. It energized my ambitions to work with the immigrant community. I took part in protests with organizations like United We Dream. I was able to experience advocacy work first hand. I sat in on conference meetings, press conferences, and networking events where I learned about research. I learned about career paths I’d never heard of. Although there is no way I could give a definitive answer to the question of what I want to do post-graduation, I have a few ideas. The ideas I have now differ from the ideas I had before my semester in D.C. However, I gained more than professional insight. I gained perspective about myself and my place in this world. Self-care and self-love were practices that I learned to implement in my life while in D.C. How could I assist others if I wasn’t taking care with myself? I did not expect to come back with so much personal growth under my belt. As a young woman, this experience helped me find my voice. I am beyond happy with my experience. It helped me zone in on possible career paths for myself. And more importantly, it has influenced my thoughts and motivations. I’m extremely grateful and proud of the person I have become after my USF in DC experience. This entry was posted in Academic Year 2017-2018, Leo T. McCarthy Center (LTMC), Undergraduates and tagged advocacy, Betty L. Blakley scholarship, California, Immigration, Jacqueline Garcia, Leo T. McCarthy, Leo T. McCarthy Center, McCarthy Center, National Immigration Forum, Newmark Scholar, United We Dream, University of San Francisco, USF, USF in DC, USF students, usfca, Washington DC. Bookmark the permalink.